2 wheels balance big loads. Engineered for ease of loading and handling. 2 wheels promote easy maneuvering and reduced stress on shoulders and lower back. Upright stance means loading is easier. This unique American designed and manufactured wheelbarrow will be the envy of the neighborhood. Move plants quickly + easily. Ideal for plants, grass, bushes, mulch, and garden tools. 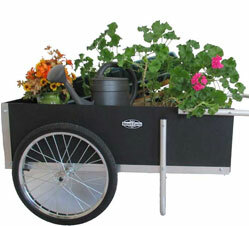 The newly developed Ultimate Gardener Cart is one of the easiest and most convenient way to work in your yard. The wooden panels have been replaced with thick heavy duty plastic cheets which eliminates rotting, warping and splitting. All the framework is made of quality aluminum and the back panel can be easily removed if needed. As with all Smart Carts products, it is manufactured in the USA following strict specifications to ensure optimum quality and durability. It also comes with a life time warranty on the frame. Use it as an all-in-one utility cart. Smart Carts legendary quality and design. 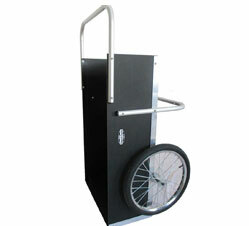 back saving, safe, easy 2-wheeled design helps ease movement and promotes well balanced load. The center of gravity of the load is directly over the wheels and axle where it belongs. 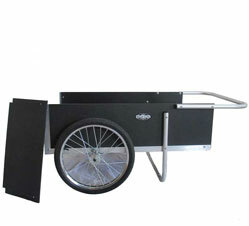 Single wheel carts merely "share" the load with the user and loads do not balance well. All Smart Water Carts include a best in the industry Lifetime Warranty.